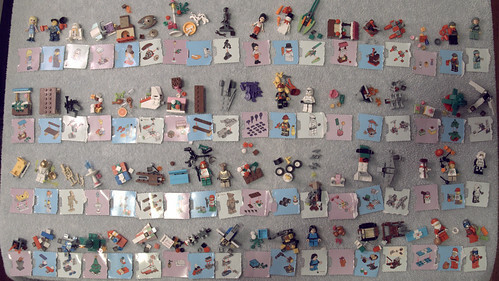 Here we have all 72 models (3 calendars x 24 days each) laid out on a towel-covered table. The pics that follow show the models and parts in various combinations. Click each image for a larger view (on Flickr). Christmas trees, hearth, lamppost, and gifts. Star Wars Advent Calendar models. 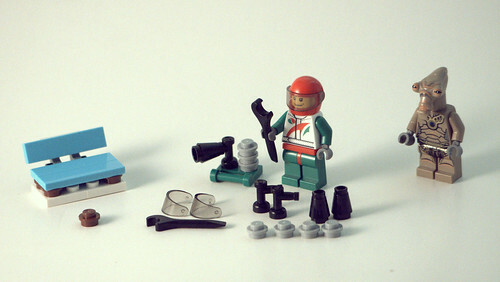 Finally, we have plenty of spare parts. Whenever there is a smaller part such as a 1×1 round plate or tile, you will often see one or two extras included along with it… I’ve shown you the extras for each day as we’ve gone along, but here they all are collected together. The final entry in the 2013 Advent Calendars, on Christmas Eve. We get two Santas: a traditional one from City (with a cool Santa hat!) and Santa Fett from Star Wars. The Friends entry, however, is a really plain (if large) Christmas gift. I would have preferred a Friends figure with a Santa hat. That concludes the 2013 Advent Calendar series … look forward to another series of them next December. Merry Christmas and a Happy New Year to all! I’ll be back tomorrow with a review of the things we found in the calendars. Penultimate day of the 2013 LEGO Advent Calendars. Today we get two sleds and a squirrel … Both of the sleds are quite intricate and well designed. I especially like the Star Wars one. And SQUIRREL! 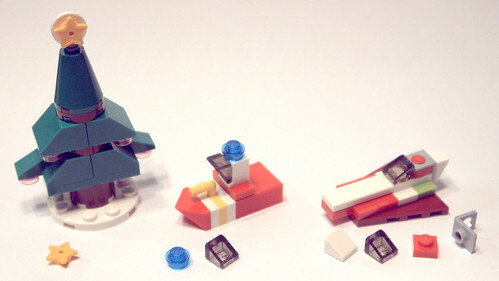 Day 22 of the LEGO 2013 Advent Calendars. 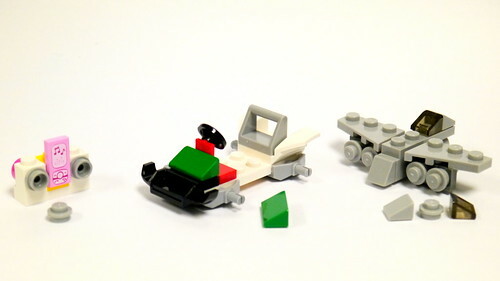 Today Friends gives us a medium azure box with a sprig of vegetation coming out from the bottom; Star Wars gives us a minifigure of the young Boba Fett (with torso and stubby legs in a cool shade of blue); and City gives us a micro scale excavator. Happy Solstice everyone! It’s finally winter. Or summer if you’re down under. Today we get a confusing musical thing in Friends, a choochoo train in City, and Boba Fett’s “Slave I” spaceship from Star Wars. The Friends model is really weird – there’s a 2×2 tile with some sheet music (the song is Frère Jacques in case you were wondering) on a clip so that a figure can hold it, but also some kind of strange thing with transparent 1×1 round pieces and a tap which I can’t figure out … some kind of horn maybe? 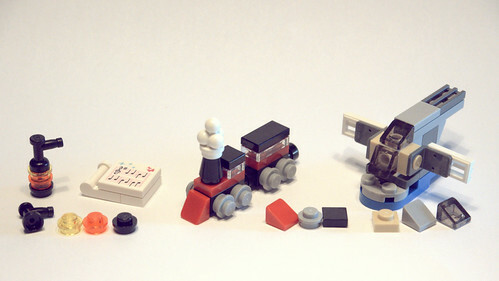 The other models are straightforward: a cute little train with one car, and a nice intricate detailed model of Slave I. 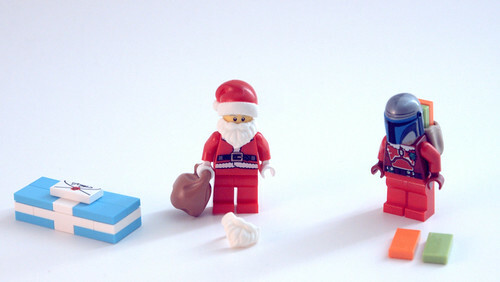 Today we get three miniatures in the LEGO Advent Calendars. The Friends calendar gives us a nice little Christmas tree; City gives us a miniature fireboat; and Star Wars gives us Obi-Wan’s Jedi Starfighter. Note: I noticed after taking the picture that the 2×4 plate on the bottom of the Christmas tree is on wrong and I missed an extra trans-pink 1×2 round plate, but don’t want to bother redoing the photo shoot. Sorry, I’m lazy. We get three new figures for Day 18. In Friends, we get the cutest little snowman! The body is made from a 1×1 brick with studs on 2 sides, allowing arms to be attached, and instead of the customary black top hat, we get a lavender knit cap! 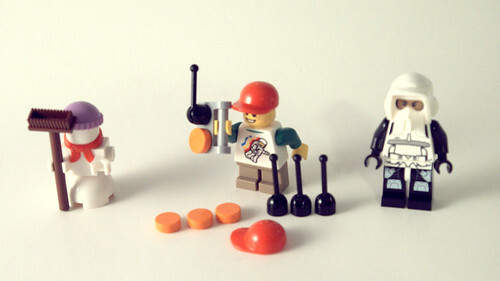 City continues the new color theme by giving us orange 1×1 round tiles, which I have never seen before in that color… also a figure with stubbie legs and a cool Classic Space theme torso, and the best part is we get not 1, not 2, but 3 extra of the orange tiles (and also of the antenna/lever part). Finally in Star Wars we get a scout trooper figure. Day 17 of the LEGO Advent calendars. The Friends calendar has a boom box with an iPod dock; City gives us the race car that goes with yesterday’s tires; and Star Wars has another mini spaceship from Clone Wars and Episode III, Padmé’s Naboo Star Skiff. The Star Wars model has a ton of small parts and some pretty good SNOT building techniques. I particularly like the telephone piece that serves as a handle for the boom box, the iPod tile, and the green double-cheese slopes (with an extra one!). Today’s Advent calendar gives us lots of accessories. 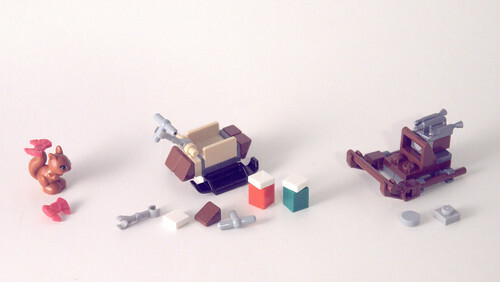 For the 15th day of the 2013 Advent calendars, we get two minifigs, a park bench, and a boatload of spare parts. The park bench in Friends is really simple, though anything that gives us parts in that shade of cyan (which is also the new Maersk Blue color) is worth having. 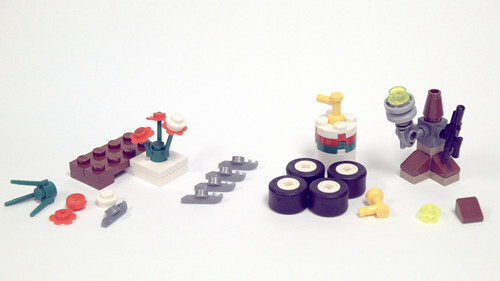 The minifigs include a Star Wars Geonosian Pilot and an Octan mechanic from City. 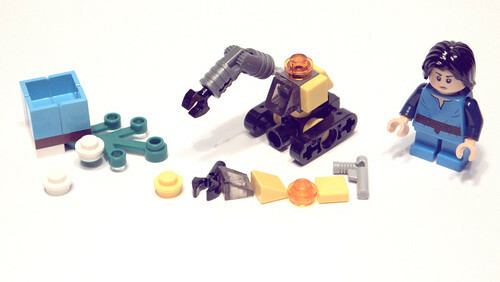 The mechanic includes some brick-built accessories (not sure what it represents) and more spare parts than the parts in the actual set!